If you haven't heard the news by now, we hope this will find it's way to you one way or another! 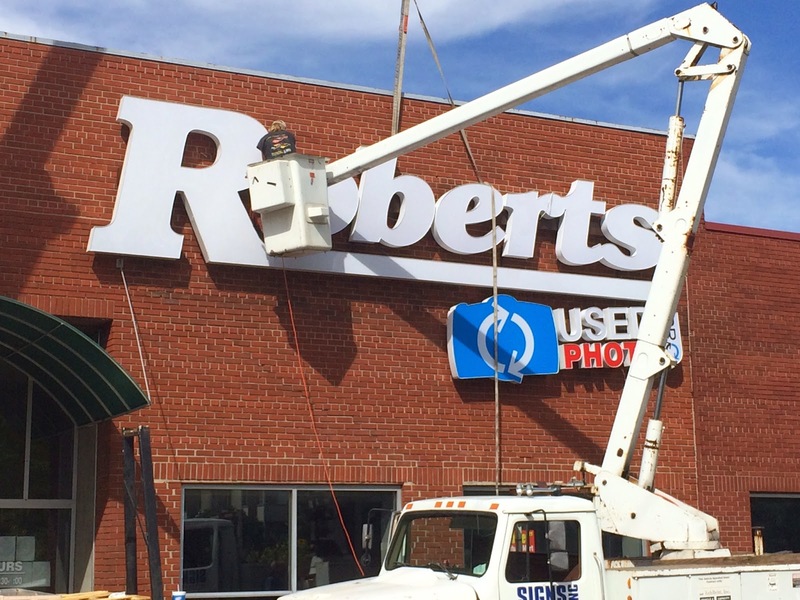 ROBERTS IS MOVING! ROBERTS IS MOVING! ROBERTS IS MOVING! - We will be closed starting at 5:00pm on Thursday October 2nd. Our Downtown store in Indianapolis, Indiana will be closed October 3rd, 4th and 5th...and the PLAN (let me really emphasize the word plan) is to reopen for business in our new location (220 E. St. Clair Street in Indianapolis) on Monday October 6th. - During these days, the Carmel location will still be operating with normal business hours and can help you with anything that you need! - For our wonderful on-line customers...unfortunately this move will delay our shipping for a few days. Therefore, please place your orders no later than 2pm on Thursday, October 2nd to ensure that your order gets out that day. Our website will still be accepting orders, but anything placed after October 2nd may not be shipped until Tuesday October 7th at the latest. We are VERY sorry for this inconvenience because the last thing we ever want to do is miss out on an opportunity to help you out, but we will make every effort to get your goods to you as soon as we are operating effectively! Are you going to make a ridiculously big deal out of the new store? Ummm...Yes! Save the date for our Grand Opening weekend, November 6th - November 8th! It is going to be big! We are going to have amazing speakers, tons of seminars, tons of deals and tons of give-aways. Trust me...you don't want to miss it. We will release all the details soon! Our commitment to the customer and to providing a great experience. We will continue to do whatever we can to make sure that you get what you need, we will listen to you and your needs and give you our best opinions. We will work to continue to give you the best pricing, and we will continue to educate you so that you can get the most out of your equipment. AND, we will continue to have a staff that is as passionate and knowledgable about photography as you are. In short - we never have and never want to be a transactional business where we see you once every 5 years when your camera breaks and you come into get a new one. We like relationships, we like friends. We want to focus on the lifecycle of your camera and you as a photographer. We hope you get your first camera here, take some great classes to learn how to use it, buy some cheap used gear as you make your way through life, trade in your old camera for cash when you get your first job and buy the hot new camera, take some more classes to master lighting, Lightroom, and light painting, let us help you with the repair process when you drop it, buy some new lenses when you get ready to go on your honeymoon, get your trip pictures printed here, trade up your camera when that perfect job comes along, get a new camera with a great lens to capture every moment of your child's first years, probably get some pictures printed on canvas, take some classes on portrait photography and sports photography, buy some BIG lenses to capture every second of every sports game, trade in your camera to help pay for college, college is over - time to get the hottest new camera with the best lens because your are finally taking that trip of your dreams! That was not short at all was it? You get the point. We want to be there for everything. Let us help you achieve your vision and capture every memory...because it goes fast right? Why else is this move a BIG deal? Well, for starters we have been in this building (yep, the one below) at 255 S. Meridian Street since 1970. That is 44 years of history, inventory, paperwork, pictures, cameras, clocks, jewelry, weird figurines and more that we have to sort through. We want to make sure that we are bringing only the best to our new store location. This move is a pretty big deal to me personally as well. My grandparents started Roberts in 1957 and truly put everything they had on the line to buy this building and make this business work. I learned a lot from them about character, loyalty and hard work. But for me, it is more about my relationship with my dad. I am currently 33 years old, and my dad has been the managing partner of Roberts for the past 40 years. That means it is the only job he has ever had and the only thing I have ever known. It means I have been coming here for 33 years. I started answering phones at the front desk when I was twelve years old. I would get so excited to come to work with my dad on Saturdays. We would go to breakfast at Shapiro's, we would open the store and I would help turn on all the lights and clean the cases (my grandmother would not let me use more than 2 paper towels and 2 squirts of Windex to clean the show cases...she was a child of the Great Depression and you did not waste ANYTHING). During the day, I would answer phones, wrap Christmas gifts at the holidays and bother the staff. My dad would take me to lunch at Union Station when they had the big food court in the upstairs area and we would always get Enzo's pizza - those really big New York style slices, and I would get a huge soda (which I was NOT normally allowed to have). And I would watch my dad stand at the front counter and go through his invoices and talk to every person that came in the door. I would see how much fun he was having (and still is having) all the time and with everyone that came in the door. He truly loves seeing people and providing great service and getting people what they really need and not talking them into something they don't. It's funny how you remember the small things so vividly. There were these containers of mixed nuts that my grandmother insisted we sell at the holidays. They were in red boxes and always sat right by the front door. There is a sign that has hung in my dad's office for years that reads, "It Is What It Is" because that was my grandmother's famous saying. I remember her hanging another sign in the store that read, 'Any Unattended Child will be given an Espresso and a Free Puppy' and she thought that was the funniest thing she had ever seen. She made everyone who came in the store read it. She also RULED the parking lot. If you were not in the store, you did not come within a 10 foot radius of the parking lot without feeling her wrath. I remember my grandfather sitting in his big leather chair at the front of the store, and he would talk with the longtime customers and watch. He'd watch it change, he'd watch it grow and I know he was proud of my dad. I remember when the wholesale district actually had wholesale businesses. Many things have changed, and many things have not. But the most interesting thing to me is still watching my dad work. His business mind and intuition is one that can't be taught, you can only hope to absorb like a sponge as much as you can in the time that you have. The best part is that I still get to come to work each day with my dad and see him having so much fun day in and day out. That's an experience not a lot of people have (and maybe not a lot of people want), but for me it makes this move that much more important. I know how much work has gone into making this store what it is today, and I know how hard it will be to continue to move this into the future. But the fun is in the challenge of it, and in the day-to-day and that is what makes coming to work an adventure where no day is ever the same. So, all in all - I think the word of the hour is 'Bittersweet.' I am excited for the opportunities that this growth will bring to Roberts, and to the photography community and to Indy. I am sad to be leaving behind such a key piece of this company's history. I am sad to walk out of that building for the last time and I am sad to not be able to look at the front counter and picture my grandmother standing there, or my dad sitting in his office laughing with someone on the phone. But, as my dad will be the first to tell you...you can't move forward when you are standing still right?